I think about this failed attempt often. While it fuels my motivation to complete a successful PCT thru-hike, it also makes me a little nervous. I’ve come a long way since this failure: I’ve hiked 32/48 of the 4,000 footers in NH and 36/46 of the 4,000 footers in the Adirondacks. I’m now comfortable hiking 20+ mile days, and I have a lighter pack. Despite all of this, most of my recent hikes have been with a day pack and I’ve gone home to hot food, a shower, and my bed afterward. I decided it would be a good idea to do a three-day shakedown hike with my fully loaded PCT pack to prove I could at least make it three days, and build up my confidence for my upcoming PCT thru-hike. This day was silly. For anyone who’s familiar with the AT, this section of trail is affectionately known as the Roller Coaster, and I ended up riding the Roller Coaster several times. My friend Rand is an AMC hiking leader and is currently section hiking the AT. While the rest of the group broke the section of the AT from Snickers Gap to Front Royal into three day-hikes, I wanted to camp and do a shakedown of my PCT gear. I left work on Thursday night and rather than go north to make my weekly commute to the Adirondacks or White Mountains, I headed south to Virginia. It was pouring rain and while it would be a good shakedown experience, I really hoped that the weather would improve for the next three days of hiking. I also discovered that I-81 south has the most tractor-trailers of any highway I’ve driven on recently. I met Mark (trail name Strings) at the AT trailhead in Front Royal, VA, (the end point of our three-day section hike) to get a shuttle ride to Bears Den hostel. Mark is a retired bricklayer and thru-hiked the AT ten years ago. I had the option of camping or staying inside the hostel but decided to save my camping experience for the next night. Bears Den has a $30 hiker special that includes bunk, shower, laundry, one soda, pizza, and a pint of ice cream. Unfortunately, I did not take advantage of this since I hadn’t done any hiking yet. 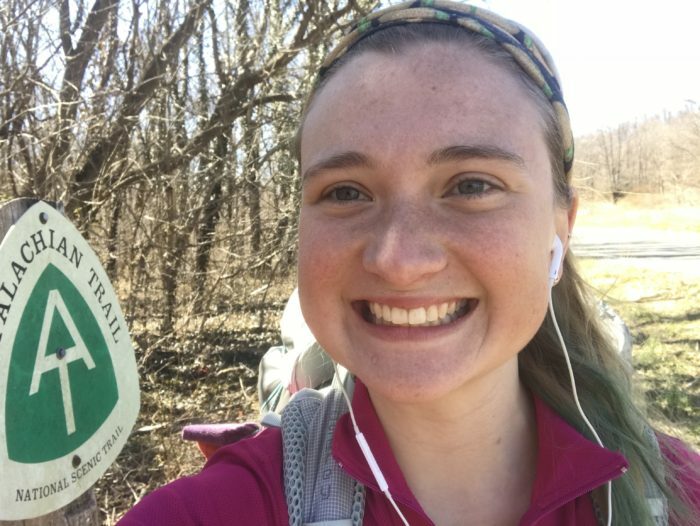 I’ll be back to try it if I ever thru-hike the AT! 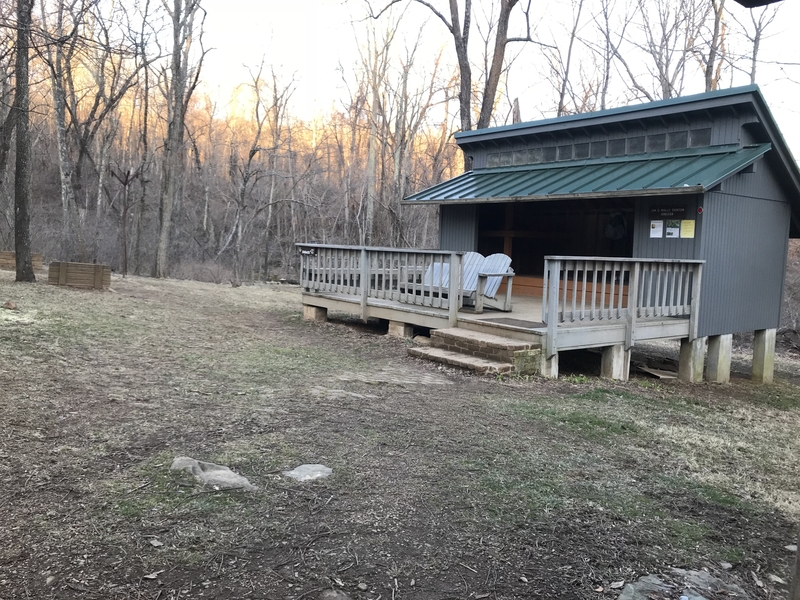 The next morning (Friday), I planned on meeting my hiking partners at the trail junction of the AT and Bears Den hostel (0.6 miles south of Snickers Gap). We would then hike south to Ashby Gap, but I would stop a few miles short and camp at the Rod Hollow Shelter. However, as I was waiting at the trail junction I got a call from my friend Rand, who asked if I could hike north to meet them at Snickers Gap. The car shuttle had gotten a little messed up so our new plan was to hike north from Ashby Gap to Snickers Gap. As I was hiking, I stopped to take off my puffy jacket. Two older gentlemen from the south passed by and were surprised that I was taking layers off rather than putting more on. It was windy and a little chilly, but I get warm when I hike and am used to hiking in the winter in New Hampshire. As Rand says, “The trail from Ashby Gap to Snickers Gap is up, down, or wet.” 3.6 miles in from Ashby Gap we passed the trail junction to Rod Hollow Shelter (where I was planning on camping originally). I was still undecided about where I was going to camp that night: I could stay inside Bears Den shelter again, camp outside Bears Den, or get a ride back to Ashby Gap after our hike and rehike the 3.6 miles in to the shelter. The rest of my hiking partners had rooms at the Super 8 motel in Front Royal and tried to convince me to stay there for the night. While it was tempting, the whole point of the hike was to do a shakedown of my PCT gear. I decided to wait to make my decision until we got back to Bears Den hostel. We stopped for a break and I assembled my go-to lunch of PB&J on a tortilla with a side of trail mix. We also passed the two older gentlemen whom I had talked to that morning. They were confused as to how they were now passing me going the opposite direction when they had seen me at Snickers Gap this morning. “Long story, car shuttle got messed up,” I said. I found out that they were planning on camping at Rod Hollow Shelter that night and laughed at the thought that I would possibly be seeing them again if I decided to rehike the 3.6 miles in to the shelter. As we hiked on towards Bears Den, we noticed the sky was getting darker and decided to stop and put on our rain gear. It started to rain, which turned to a wintry mix but luckily stopped after only ten minutes. Anyone who knows me well knows that I hate making decisions. All throughout the day’s hike I was trying to decide where to stay for the night. We had now arrived at the trail junction for Bears Den hostel, and I was forced to make a decision: my hiking partners were anxious to get back to their cars and didn’t want to stand there long waiting for me to decide. It was 6 p.m., but I made the decision to camp at the Rod Hollow Shelter. I got a ride back to Ashby Gap and started hiking—fast. It had taken us one hour and 50 minutes to hike in to the shelter that morning, but I was determined to make it to the shelter before dark and made it in one hour, 15 minutes. As expected, the two older gentlemen were already at the shelter so I explained that I was doing a shakedown hike for the PCT and didn’t mind the extra repeat mileage. I woke up around 7 a.m. to hike the 3.6 miles (for the third time) to meet my hiking partners at Ashby Gap. We then continued south toward Manassas Gap, where they would be ending for the day. I was planning on stopping early to camp at Manassas Gap Shelter, but I decided to push on since it was only 2 p.m.. Since it was only March, it was still too early for the thru-hiking bubble, but we passed many people out for a weekend backpacking trip. At the parking lot, I said goodbye to my hiking partners and continued on three uphill miles to the Jim and Molly Denton Shelter. The sun was shining, and it felt awesome to be on the AT and free from my cubicle. My friend Rand had given me two glacier cherry Gatorades so I drank one in the parking lot and put one in my pack to drink once I got to the shelter. I stopped at a stream to filter water, hang my wet pair of socks on my pack to dry, embrace the sunshine, and rest before starting my uphill climb. Since I was now alone, I plugged my phone into my battery pack and let it charge a few minutes so I could listen to an episode of the Backpacker Radio Podcast while hiking to the shelter. It was still early so I wasn’t worried about getting there before dark. It’s funny, because if I’m hiking with someone else I don’t mind hiking in the dark, but if I’m alone I get completely creeped out. I guess this is something I’m going to have to work on. Smiling because it’s sunny outside, I’m on the AT, and I’m wearing a custom taco buff that my friend made. Sixteen miles down, three (uphill) miles to go. At first glimpse of the Jim and Molly Denton Shelter, I thought it was someone’s house. This shelter is fancyyyy. 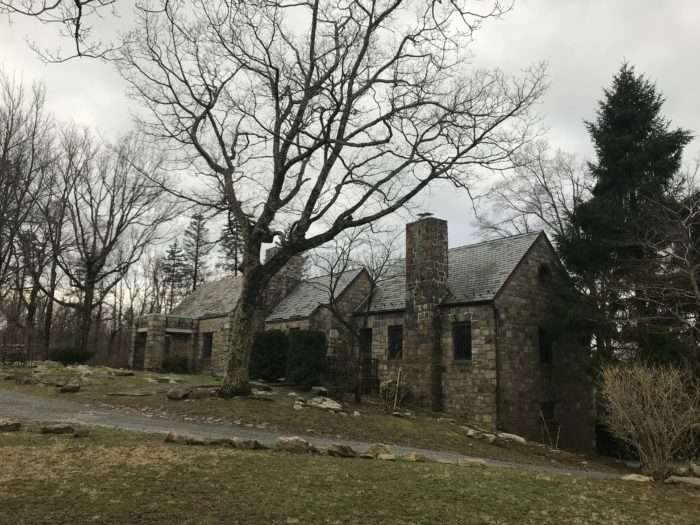 It has a deck with Adirondack chairs, outdoor solar shower, pavilion and picnic table for meals, and a privy stocked with toilet paper and hand sanitizer. There were already a few people at the shelter cooking dinner, and we chatted as I made ramen for the first time in my camp stove. I’ve been on several backpacking trips so I think it’s funny that it took me this long to make ramen. I brought my JetBoil Mini Mo stove on this shakedown hike, but I was on the fence about bringing it on the PCT since it’s so heavy. After seeing everyone else at the shelter with their lighter stoves, I made the decision to switch to an MSR Pocket Rocket 2 and Titan hettle for the PCT. After dinner, everyone else chose to camp in their tents rather than stay in the shelter. Since it was such a palace of a shelter I felt like someone should sleep in it, so I set up my sleeping bag and pad on the second level to avoid mice. I’ve since decided to bring a Sea to Summit Aeros Ultralight Pillow on the PCT as my luxury item. Jim and Molly Denton Shelter. This was a short last day and even shorter for me since I had hiked the first three miles the previous day. My hiking partners weren’t meeting me at the shelter until around 9:30 a.m., so I cooked some oatmeal and coffee and relaxed in my sleeping bag reading Thirst on my phone. As I read, I thought about my reasons for hiking the PCT and how I was happy that I didn’t give in and sleep at the Super 8 on the first night.